Initially, I’m very iffy when it comes to books with multiple POVs. But for this story’s case, it suited. TIWIE is a novel that gripped me at every page, portraying an all too realistic scenario, one that no one can ever imagine occurring happening in their lifetime, but has already occurred 15 in the US alone this year (source: Wikipedia). In 54 minutes, every student and teacher present in the auditorium of Opportunity High School, Alabama, is fighting for their lives against one boy, one of their own. What was frightening about this story is that it can happen everywhere. But there’s a difference between hearing about that and being thrown into such situation. This book follows a few different characters during the hour that the shooting takes place. Each character is so completely different and so important in their own ways. I think the central aspect which I really enjoyed was the diversity of the characters. There’s a scene where Tomas is worried for Fareed and how, his faith and heritage, may portray him as a threat to the police officers was a touching moment for me because of how real it was. I really hope more authors begin to write about marginalised character because, honestly, I’m all for seeing more Muslim characters in novels. However, I do believe the psychology behind the perpetrator’s act was a bit foolish. It boils to the simple “He was evil,” and that’s it. We never really find out why Tyler did it— he goes from being a supportive brother to someone who beats and abuses his sister. 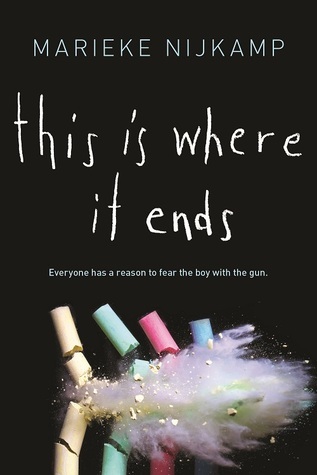 It’s too simplistic, and I think that was a fatal flaw in this novel, along with missing out a chance of looking at the psychology of teen shooters and focusing more on the cheap thrills. Overall, it was an exciting read. Though some scenes felt strange, I don’t want to judge because who on earth would know what they’d do in this situation when they don’t know what else is going to happen?